One of the most important aspects of any system is the protection of information and compliance with company and government rules. Exchange Online from Office 365 is simple to use and administer, but don’t let that fool you. Under the covers, Microsoft has spent a tremendous amount of effort on protecting you from digital threats and making sure that you are in compliance without hindrance. Each person has an e-mail box as well as his own archiving system. 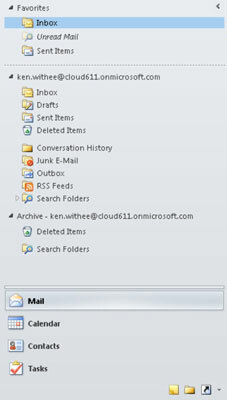 An archive shows up in Outlook as another mailbox. The intended purpose of the additional archiving folder is to store older e-mail in a permanent storage location. You can think of your archiving folder as your attic or basement. You can go in there to retrieve stuff if you need to, but it is really a long-term storage location. The size of a user mailbox and archive are dependent on the SaaS plan. Some plans have a maximum mailbox capacity of 25 gigabytes and others have unlimited archiving capacity. The Exchange Online offering includes antivirus and antispam control without needing to install any third-party or external software. When a new message comes into Exchange Online, it is scanned for risks before being delivered to the intended e-mail box. The technology that makes all this protection possible is called Forefront. It is another Microsoft product that works behind the scenes to make the environment safe and secure. Don’t worry though — you don’t have to pay extra or even know how it works. As an end user, you just know that someone is looking out for you so that you don’t inadvertently receive spam or virus-infested files. The government has added many rules and regulations around corporate e-mail. Exchange Online provides the ability to meet these rules with features, such as eDiscovery and legal holds. eDiscovery refers to Electronic Discovery, which simply means that electronic messages can be searched for relevant communications in the event of a legal process. This might not be a big deal but if you are in a heavily regulated industry or government organization, then these features are often required by Uncle Sam.